BY ZACH BAKER Calvert’s Maddy Ball applauds after reaching third as Old Fort’s Savannah McCoy stands at third base in the first inning Friday in Tiffin. The first two Calvert batters of Friday’s game against Old Fort reached and scored, and the Senecas led 4-1 after two innings. But Old Fort pitcher MarcQue Harris settled down, and the Stockaders’ batters went to work. They scored two runs in the fourth and put up a five-spot in the fifth, going on to beat the Senecas 8-4. Harris picked up the win, going all seven innings and allowing two earned runs on six hits. She walked three and struck out three. Calvert took the lead in the first when Mara Mangiola singled and then scored when Maddy Ball reached on a three-base error. Ball later scored, and Calvert was up 2-0. Old Fort answered in the second when Laini Gillett walked and then scored when Savannah McCoy tripled to left. Calvert put up two more runs in the second. Maddie Schumacher doubled, Ashlee Shiley walked and Caitlin Borer and Mara Mangiola each had RBI singles. Old Fort then started a rally. Trailing 4-1, the Stockaders got an RBI double from McCoy and an RBI groundout from Kaley Ivey. In the fifth, the Stockaders broke it open. Down 4-3, Karli Colson led off and reached on an error. Jillian Stover then singled, and Ashlyn Magers reached on another miscue, scoring Stover. Emily Hull then singled in a run, and Harris followed with a two-run single. Later in the inning, Ivey’s fielder’s choice drove in another run to make it 8-4. Calvert had a few more threats, getting a runner to second in the fifth and putting runners on second and third after a double by Shiley. But Harris worked out of it to collect the win. Borer took the loss in the circle. She allowed eight runs, six earned on six hits, three walks and four strikeouts. 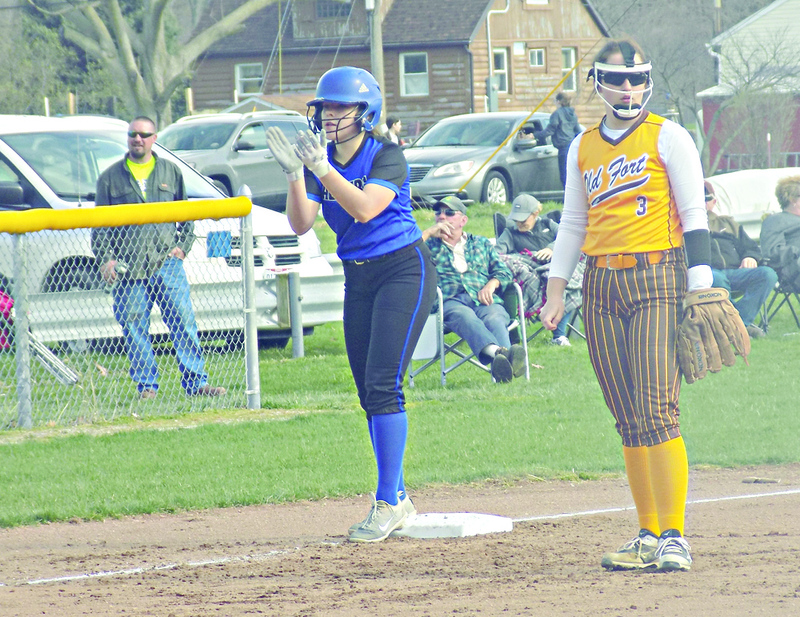 Ava Sarka homered for the third-straight game — she has six blasts on the season — and drove in three runs as Columbian run-ruled Port Clinton, 14-2. Kennedy Coots and Addie Morlock each drove in two runs in the win, which improved the Tornadoes to 5-3. Columbian scored three runs in the first, five in the second and six in the fourth. Dani Keckler had two hits — including a triple — scored three times and drove in a run, while Coots added two hits and two runs scored. Carly Schafer singled twice, driving in a run and scoring, while Morlock had two hits. Megan Fry scored twice, singled and drove in a run. Haileigh Kutscher picked up her first varsity win, throwing five innings and allowing two runs on four hits. She walked three and struck out three. SANDUSKY — Lakota managed just three singles Friday, and lost its first conference game, 11-0 to Sandusky St. Mary. Maddy King led the Raiders’ offense by going 2 for 2. Maddie Bowling had a base hit. Allysa Duval started on the mound for the Raiders, going 2 2/3 innings and allowed nine runs, four earned, on three hits. She struck out three and walked seven. Bowling relieved, and went 1 1/3 innings, allowing two runs, neither of which were earned. She didn’t allow a hit, and didn’t walk a batter. Lakota was hurt by four errors.